I knew I wanted to join in. Yeah, I might have thought that was the ultimate impossibility. And yet, here I am at the ripe old age of 29, and I’ve now lived in my very own from scratch, 95% DIYed, cash-bought dream home for 2 1/2 years. So…how did we do it? A few months before we got married almost 7 years ago, we bought an 1,800 sq. ft. house in a rural subdivision. It was cute and came with over an acre of land—the perfect starter-home…for us, anyway. We spent the next three years doing the usual newlywed sprucing. Okay, maybe those last two aren’t the usual, but it was good practice for later on for us. But by the end of that three years, we had two little boys, and we knew we wanted more kids someday. We also loved the idea of space and lots of it. So, when we found a beautiful 28-acre piece of land about 5 miles down the road, we bought it, intending to sell our house and build on the new piece of land one day. We put our house on the market, and my husband and father-in-law built a barn so we wouldn’t have to rent storage whenever we did move. (The wall-raising day happened to coincide with a raging storm, complete with gale-force winds. As I’m sure you can imagine, it wasn’t ideal; I seem to remember something about the wind blowing a wall over. Like down. On the ground). I ♥ our green barn! (This picture was taken right after we built it over two years ago; clearly, we were able to get the walls back up). One month later, our “starter house” had sold! So, we packed up and moved into the second story of my parents’ home, complete with a full kitchen, a washer/dryer combo, and two bathrooms (yeah, we were roughin’ it). We drew up our own blueprints and quickly discovered that what we wanted was a custom house without having to pay custom prices. So for the next year, we spent most (pretty near all) of our waking hours planning, scouring the clearance aisles at Lowe’s for deals, haunting local bargain surplus stores, sourcing contractors for the few tasks that simply weren’t worth taking on ourselves, and then…what else? Not daunting at all, right? Better…but still an insane amount of work to do. So, how did we manage it? Especially with two children under two and the need for my husband to continue working to provide income to live on and, well, pay for the house? Have you heard the, “How do you eat an elephant,” dilemma? Bit by bit, day by day, we kept at it until, lo and behold, a house emerged. If that sounds too easy, let me assure you, it wasn’t. So, what all did we do ourselves? Well, it would probably be easier to list what we didn’t do. Everything else—from tiling to wood-floors, from spackling to painting, from electrical to plumbing, from framing to trim, from stair-building to crown-molding, window-installation, tub-installation, can-light-installation, you-name-it-we-did-it-installation…it was all us (mostly my crazy-talented and efficient husband with plenty of help from my equally talented and dedicated father-in-law). And, if you’ve been around here at 5D5W for long, then you know that, several of the things we didn’t do ourselves, we bartered services for. My husband is a talented computer programmer and web designer, and we got a deep discount on both our A/C units and our kitchen cabinets because we found top-notch craftsmen who needed websites built for them and were willing to exchange a hefty portion of their fees for a custom site. No make-up—check. Dew-rag covering greasy, unshowered hair—check. Paint-stained top—check. (I think I’m making microwaveable brownies here since the microwave was our only appliance with electricity at this point. Mmm mmm, good). The day our walnut butcher-block (part of the cabinet barter) arrived was thrilling in the extreme! I did a post on the entire kitchen reveal if you’re interested in seeing more details (including how we managed to score our entire kitchen appliance suite for $1,300). And here’s a collage of shots from some of my favorite (mostly finished…really, when is a room ever completely done?) rooms in the house. I’ve done posts on all of these rooms as well if you want the deets. So, what did I learn from our year-in-building experience? 1) Sleep isn’t nearly as essential as you think it is if there is an end in sight. What is essential is being slightly crazy (the sleep-deprivation helps with that). 2) Having an incredibly gifted husband who can work magic with a hammer or a keyboard in his hands is…I won’t say a necessity…but definitely an invaluable plus. 3) Building a big two-story “box” house (with small little variations like the bay-style windows in the breakfast nook) saves money both in construction costs and heating and cooling. 4) Lowe’s managers who are motivated to move their inventory are absolute godsends (I did an entire post on what I call “retail haggling,” in which I describe my methods for getting name-brand items like light fixtures and faucets and toilets—oh my!—for next-to-nothing). 5) Giving up one year of your life to own your dream-house free-and-clear while still in your 20′s is sooooooo worth it! Here we all are enjoying our front porch last Easter. And now, I’m dying to know what you think? Or would you do it if you had the chance? Finally getting a home of your dreams with everything you like, less of what you have not from the last houses you lived in up until now. Building does require slow careful thought…thank you for this neat personal blog on your experience building a home from scratch DIY! Hi, I’m getting this error msg for all your links. Are they broken? The short link you’ve clicked is either wrong or retired. You. Are. Amazing. Talk about Super Mom!! I seriously wish I was half this talented …I also wish I had seen this six years ago when it was originally posted LOL! Thanks for sharing, Abbie!! Loved the article. As a home inspector near Tulsa OK, I inspect a lot of new home construction. Your advice is spot on. You could be a great help as a consultant to others looking to build their own homes. There are companies out there like Ubuildit that specialize on helping others build their own homes. Just a though! Thanks for the article!! I do have a 2-year old St. Bernard, I’m planning to let her live outside the house. Basically, I need a house for my dog and I saw this dog house which has different styles and designs. Some of the houses are beautiful, spacious and looks comfortable to live. What do you think about the dog houses? I’m open to more suggestions, though. You may be certifiable, but if so, so are we. We are doing basically the same thing, except we are 61 and 65 yrs. old. Selling a house we remodeled and building a new one from the ground up on a heavily wooded 22 acres. Life is an adventure. And for us, retirement hasn’t been boring yet. With a house to build and a yard to design (later), our plates are full! And we love it that way. Thanks for sharing your adventure. I love the house. I hope I can build one someday. Love the images and story of how you did it. For bank loans, completion before the closing makes slow going, building piecemeal harder to pull off though. How did you get the $100,000 cash to pay for the house. My husband and I are 26 and have been dreaming of building our own home. We have all the knowledge and resources to do it but no way of saving up enough cash. I save my money and I hope that soon I will be able to build your own house Thank you for sharing your knowledge and an ideas! Definitely massimo, all of us who have homes started from scratch. sometimes with nothing but we managed to have our own houses. first start by buying the land and then you can go to the nearest hard ware and start buying the materials as he/she keeps for you. when they are enough to start, you start, and once you start there is no stopping. Absolutely awesome! I always wanted to build house, and your blog inspired me so much! Thank you! Elgraw, i know what it feels with that in mind. I and my husband really delayed in building our home. so i got tired of waiting for my husband to bring a solution. this is what i did, i had some cash and so started building iron sheet house in our half acre plot. but my lord, i thought it was easy and cheap to build such a house…to my amazement i ended up borrowing so much from my friends and finally, with my hustles, the house..3 rooms house was standing. My husbands congratulates me up to today and that has enabled him to put a permanent house which we now live in..thanks to my craziness of owning a home. Great job! Love your house and your style! I just found this blog recently on FB and I loved reading about your DIY house. My husband and I built our 1st house about 12 years ago with cash when we were in our mid 20′s. It has been the number one thing that got us ahead financially. It allowed us to take time off from our jobs to stay home with our kids, and enjoy life. Our jobs changed and so we moved to a sub-division 4 years ago to be closer to my husband’s job. It was a beautiful house, but we didn’t have the freedom we had in the country. So we bought some land, moved out in a trailer on the land, and are about to start building a DIY dreamhouse… again! I love to find others who are brave enough to do this. My hunsband, like yours, is extremely good at building. That surely helps this process work! I am extremely good at finding deals. So we are a good match:) We are using part of our equity from the other house to by more rentals, so we hope to get ahead again by doing this mostly DIY again – with cash! Love that I found your blog. It is very inspirational! My husband and I have a “build-your-own-home” goal too! We just started the planning and to-do lists! Thanks for sharing your story! were on a similar journey guys, i gotta say its encouraging to say the least that there are still people out there who are motivated to actually GO FOR IT!!! Hi Abbie, I just Love love love this post on building your dream home for less 100K. My Husband and I are about to tackle our own home build next summer with 2 boys 5 and under. Thank you so much for this in depth picture for whats in store!! I’m so glad to have found your blog! And I’m in TX too! My in-laws have been so generous in giving us land to build. And it already has a cement slab to build on! So we’re hoping within the next 5-6ish years to get most everything done. What I’d love to know though is your budget and expenditures for doing almost everything on your own and for outsourcing. If you’re willing to share! Anything more I can learn about the process would really help me out! I’ve spent the past year remodeling a home we bought, and haven’t got nearly as much done! I can’t believe ya’ll built this in a year! My newest thing I’m thinking about is converting a stable into a house… I’m not really happy in the city so our goal is to move to the country where we have acreage! Thank you so much for this! I’ve been dying to build our own home. My husband, 17 month old son, myself and baby to be in July, currently live with my folks. It sounds like a total adventure full of hardwork but tons of reward. I will be sharing this with my husband for sure. The place looks absolutely beautiful! And $100,000 is SO cheap. Are you still living in this space? How much did home decor run you? Thanks for the great post. It’s amazing to see what can be done with a little hard work and an eye for design! That is absolutely awesome. Very inspiring! My husband and I are definitely trying to do something like this and it is great to read stories about those who have already accomplished it. Sweat equity is priceless. Do you have any more pictures of the barn? I would love to build something like that! So, I didn’t read through all your comments, but I have a question. Forgive me if it’s already been asked and answered. How did you figure out (in the planning stages) that you would have enough money to build the house? Is there a reliable way to get an estimate on building your own home and doing most of the work yourself? Amazing work! It’s great to see that a lot of hard work, sweat and probably a million tears pay off into a house that is perfect for you. The house is beautiful, loved the photos! Hello. My Name is Diana. I am crazy about God, number one. Number two well i was depressed i want to build a house so badly we live in Zimbabwe and well we are planning to buy a small plot of land and then build. I was feeling overwhelmed by the enormity of it all and when you said ” how do u eat an elephant ” something clicked in my heart and the weight just lifted off. May God Bless you and your children. may you continue to encourage more men and women around the world.May you be filled with joy always. This is so inspiring! I found this blog while doing research for my own diy home. My mother is in the middle of this process as well, and I am very excited to start my home next year. Please keep my family in your prayers as we take this on. Your story is fantastic, what an inspiration for others to build their own house. I have 2 children and must say its very easy to make excuses not to do things because there isn’t time. I love the design and the fact you didn’t spend the earth to build it. That is AWESOME!!! As an Army wife, I’m a long ways from building my custom home, but I love that you guys DIY’d it…and it looks fantastic. Seriously! Awesome story!! I’m a numbers person too, so does the 100,000 include the lot/land and the moving debris from the land as well? Thank you. Hi Abbie, your house is amazing I am so in love with it, but I miss one thing floor plan. Would you be so grateful and make some? I loved reading this! I 24 and am currently researching everything i can as i’m planning on taking on this daunting task this spring. I want to diy for pretty much everything, kitchen and bathroom except for essentials like stove, shower, fridge etc obviously! lol I’m aiming for a rustic feel and sticking to budget. I think in the end it will be worth the hard work to live a debt-free stress-free lifestyle. I also believe it will make my home that much more special. Thankfully, i have helping hands from family so that my dream can become a reality. Thank you for sharing and for showing me it is in fact possible to do something like this. I want to document this journey for me as well. …Wow…Well, since I know so much about you I think its only fair I share a little about me. My name is Brandon, im 28, mechanical engineer, live in south texas and I absolutely love this article. I have been thinking about building a house vs buying one. This page has been inspiring, keep it up. You and your husband are a pretty good looking couple and I love your house. Escpecially the countertops in the kitchen!! Thanks for sharing! If I could make 250% profit on 100 grand I would do it in a heartbeat! Many, many times!!!! I am impressed! You deserve all the credit you can get and then some. I am curious if took notes about tasks as you went along in particular about things you would do differently if you did it over again. You know…. (a sort of ‘lesson’s learned’..kind of record. I would love to get a hold of something like that. Also, can you recommend some good books you came across when doing your build…Could you maybe post those for everyone? Thanks, and congratulations again…..well done. that’s amazing, but is this practical for normal people? i’m in the very early stages of sort-of-planning a new home build, and i can’t think of anything that i have the actual ability to do that would be worth the money it would save measured against the 10 years it would take me to do myself (and then rip out and pay someone to do right)–and i’m a former civil engineer. it’s hard for me to fathom that a computer programmer just decides, know what, gonna built me a house! did you guys have some level of construction experience, or are you just the kind of people that average folk hate for your ability to just decide to do something that takes professionals years of training and experience to learn to do well? and practically, how did you pull it off? when i think about something like site clearing, i figure that by the time i spend the money to get the tools and resources to do it myself, i’d probably save money by having it done by the pros. Awesome! You guys rock! We’ve been building homes for years and don’t think it’s ever been as much fun as what it looks like for you all. Great job!! First I just want to say…AMAZING. I admire you and your husband so much! I was hoping you would do a post that includes a glimpse of your floor plan for your fabulous house! It the only thing I think that you haven’t posted. Thanks so much! Hi Abbie! I love your story! My lifelong dream has been to build my dream home. Of course, my plans have changed over the years, but I do believe everything is almost perfect! The estimated cost of building my 2,144 square foot a-frame dream house is $200,000. Not to mention the furniture and decor in and outside of the house or the decks and other little tidbits that I believe we can do on our own. I would definitely build my own house if I, my husband, or any of our family members had any idea how to do it the right way. Saving a little money is right up my alley. Unfortunately, it looks like I’m looking at a hefty loan and my neighborhood contractor! Thank you for reminding me that even if we can’t do everything on our own, we can still be surprisingly self-reliant in many ways! p.s. I love your website! Such a huge fan and you are such a role model! Wow! My boyfriend and I are about to embark on a similar journey, and right now we’re just a giant bundle of confusion- how do we pay for it? is this even possible? are we crazy? One question you might be able to help with- how did you manage a septic tank/other waste removing device? I don’t have the slightest idea where to start with that. Thank you so much. I stumbled onto this post while researching DIY home-building, and I just want to say, I got choked up with hope and inspiration knowing that what I felt was a ridiculous impossibility is actually quite possible if you’re willing to grit your teeth and get dirty and creative. Your home is beautiful, and makes me feel a lot less hopeless that within a few years, I could be taking photos of something similar of my own. I’m 27 and my fiance is 31 (I’m blessed he’s also super handy), and this makes me feel like it’s never too late. Thank you. Now I’m off to read the rest of your blog. Abby, I can so relate! We have bout an 1100 sq ft home two years ago, but we want to rent it out and build our own. We have an eye on 45 acres for extremely cheap. We have 3 kids, ages 2 and under. Our oldest is potty trained, but she too prefers to become constipated rather than poop in the potty…..don’t understand that thinking! Anyway, thanks for posting. Your story is an inspiration that our dream is possible. Thank you so much for getting back to me so soon. We are so excited to build our own home and your blog gave us that extra motivation and belief in ourselves. Thanks!!! Just the house. We got a great deal on the land, but it’s almost 30 acres, so getting it and the house for 100,000 wouldn’t have been possible. However the appraisal of our house @ $250,000 only includes the house, so that’s what we would.have paid for our house alone if we had bought it. The 100,000 also includes”extras” like the pergola we built. Quick question… Did it cost 100,000 for just the one or the home and land? My husband and I are considering either building our own home or remodeling the 150 year home we are in currently ( my childhood home ). We are trying to figure out which will be cheaper to do. However, the idea to build and create our own home appeals to me far more (I love crafting and creating). Thank you for the motivation! Love. After reading your story, the first thought that came to my mind was, “Wow! Even though it likely exhausting, what memories they will have.” My hubby and I tend to argue, puff and groan when we tackle anything together –more him than me, since i am the handy one in the relationship— but ALWAYS at the end, when we sit and enjoy our work, we realize that it made us closer in the end. Your home is beautiful! I am sure it, as your family, will evolve throughout the years. Treasure that. You have created a beautiful home for you and your kids. You have both done an amazing job on a beautiful house, congratulations! My husband and I designed and built our own garage/workshop and did everything, so I know a bit of what you went through although we don’t have a kitchen or bathroom, etc. It is a major job, which needs many types of talents, but brings a whole lot of satisfaction. Your barn is fabulous as well. Abbie! I did not know you built your house. Serious awesomeness. We did too! So yes, I can say without hesitation that you are crazy and certifiable. Nice recap. It is so hard to put all of the experiences (and emotions) that go into building one’s own house into words. This is fabulous!! I actually just started following your blog and then laughed when I googled “build your home” and your blog popped up! I didn’t know you built your own home. My fiancé and I are considering doing the same thing! I’m getting ready to go back and read through all of your posts. I read this post because I’m in the planning stages of building a house mostly DIY too. But I’m commenting because my friend sent me an article today about how kids who hold back during potty training can end up with expanded rectums even after they begin to poo regularly. Which pushes on the bladder and urethra so it can lead to lots of accidents or bedwetting (the issue for her son and mine). It takes an xray to see but is solved fairly easily. Hopefully it’s not an issue for your son, but the day’s coincidence of me reading up on 2 issues going on in my life and finding an article that is about one but mentions the other just made me want to share. You and your husband are an awesome team. The house is amazing. Your colour schemes are beautiful. I just came to your blog accidentally…and I’m so impressed and what you & your husband did! Incredible!!!! As commendable as your beautiful home is, your “can-do” spirit is even more commendable! There is SO MUCH to be said for hard work, the pride of accomplishment, and the “stick-to-it” spirit!!!! That impressed me the most! The home is darling and lovely but what you have done as a couple, so young, and with a young family will serve you well in many years to come because now rather than having to work to support a home….you can enjoy your family because you OWN your home! GOOD FOR YOU and your HUSBAND. BTW…..what darling children you have! PS: I would love to have done this but though I married the best guy in the world…..he and a hammer are not compatible! ) Love him anyway! This is so inspiring.. Your house would be so special for you, every small detail in the construction is customized by you and your family. I love the indoor decor and the house.. Beautiful home. Wow, very impressive, and my dad built his first house almost entirely by himself, so that is definitely in my blood. But my hubby came from an academic home where they were not DIY-er’s, so this is something he would never tackle. I’m so glad you joined cowgirl up, and hope you come back again next week. I tip my hat off to you guys. The two of you have done EXACTLY what I have wanted to do for years but never knew how to get started. I plan on making the hubs read your post tonight to give a little extra fuel to the fire, to say “hey, we can do this too”. You’re a great inspiration!! You deserve a huge pat on the back! That is the ultimate DIY project- and I can’t even imagine the pride that comes from building your own house. Thank you for taking the time to link up to “Cowgirl Up!”. Such an amazing story that proves– you can do anything if you put your mind to it. What a great example ya’ll are setting for your kiddos. I love your house and I love that you did it on your own! I am 23, and my husband is 24. I just graduated with my bachelor’s and I’m getting ready for my master’s degree, and my hubby is working nights (and days, and mornings…) in a restaurant until he gets a job in his chosen field. After all is said and done, we want to do exactly what you did. My in-laws built a couple of bedrooms and a bathroom in their basement so that we, along with our baby, can live down there while building. Have I mentioned I love my in-laws?! We’ve designed the plans and started piling materials in the back of hubby’s parents’ shed. We were gifted land by his deceased grandfather, and I must mention that my father-in-law has 9 brothers and 2 sisters, and all are talented with a hammer! For the price of food and materials, my father-in-law’s family will come in and do everything, including electrical and plumbing. The women all offered to paint. Oh, and they are all certified, since this is what they do for every newly married couple in the family. I am so blessed. How ambitious of you! We need more young people willing to work for themselves like you. We added onto our home–3 stories– and did almost all of the work ourselves while both working full time and in our fifties, so I know what you were dealing with! Good Job! WOW…I am speechless. This is about one of the neatest things I have seen/read in a long time. MAJOR kudos to you and yours!!! Really impressive. And how neat is it that you have all those memories and the pride of knowing all that your hands did! I LOVE your house…so beautiful!! And I wish wish wish I had a walk in closet. 1850 homes just didn’t believe in closets…at all. We own our farm free and clear, but it’s a story of my husband saving since he was 12 years old, and God basically giving us our farm for what we sold our first little house for (we had saved up enough by then to pay off the mortgage by living REALLY tight). So fun reading your story!! Thanks for sharing. I think you’ll be seeing me around your blog much more. You’ve won my heart. WOW! This is an amazing house for professionals. It’s even more amazing that DIYers could do it this well. You are my hero! Oh my goodness! That is wonderful! What a beautiful home you have! I can’t wait to come back and check out more of your awesome ideas! This is awesome! We have a link party ending tonight… would you like to add it to our link party too? You could be featured next week! This is our dream! We are starting to pay all our debt off, then we are putting our house on the market next year, rent a small place while we build. We may not be able to do free and clear right away but we will be shortly afterwards. This is great information and I will be showing the husband this. So inspiring! I’m so impressed. You did a beautiful job and what a great story. I’m a new follower. You will be so glad for the rest of your days that you had such wisdom early on! You will be able to build such security for your kids. The house is great-really great. But oh, the family! You are all so darned adorable! I hope you will have many many years of happiness together in your special home. Wow, I read your whole post! That is an amazing story. WTG! It is amazing that you are in your twenties and have your house free and clear. I am excited that our house is almost paid off and I am 36 (even that is a feat!) Although, our house is pretty small, your story is great inspiration, maybe someday we can build our own dream home, my husband is pretty handy and so is my dad, I bet we could do it. Oh wow, your house and this story are both amazing! I am in love with the outside as well as the inside, especially the colors and the kitchen! We recently sold our house but have no place to go and need to be out well before we could ever possibly BUY a house so much to my dismay we are going to have to move in to hubbys grandmas house that she wants to sell us. I dont like the house, its not ideal in the least, but it was appraised at $165k and she is going to sell it to us for $85k so its definatly a deal. The kitchen is just incredibly small and we will have to live with her IN the house until she finds a place and moves. I know it is the best move for us but I have been kicking and screaming about it since I never wanted that house. I would LOVE to build a house of our very own like this, I lost two people in my life that would know how to build houses like this, hubby has a friend who used to build houses and his step father builds houses also so I am sure they would be happy to help us with the task so maybe one day we will have a gorgeous house like yours! Wow, what a story! Ben and I are in the planning phase of buying a bunch of land and building a house. It is probably still 2-3 years out before we even buy anything, but what you have done is exactly what I want to do. I will definitely be keeping in touch with you over the next 3 years as we begin this process! I will have lots of questions. You are such an inspiration. I think this is the “impossible” to top all “impossibles” and I am so glad that you shared it with us! Congrats on the feature from Kelly. This is fantastic! Owning a home free and clear is the best thing we’ve ever done and brings so much peace of mind. Congratulations! I am beyond impressed! Seriously! My husband and I are currently in the process of building a home… but aside from a few lighting fixtures, we haven’t done any of it ourselves. 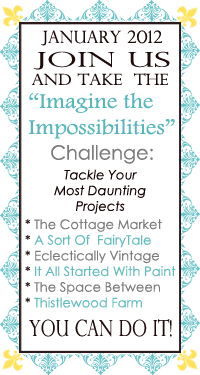 Your fabulous house is being featured at the Imagine the Impossibilities Challenge! Fantastic, way to go. So proud to see young people working together and building such great futures together. Yes, we have done similar. Not from he ground up, but purchased a 1920′s bungalow and tore off the roof adding entire upstairs. Purchased for 72K, renovation cost 20K, sold for $250 less than 8 years later. Doing similar once again. You have an amazing family. Enjoy!! BTW…found you at Get Outta My Head Please, Show It Off Linky Party 10. I am bowing down to you now! This is so amazing – your house (and cute barn) is fabulous and you guys must be so proud! You’ve got style too!! So glad you joined our Impossibilities Challenge – this truly defines the challenge! … seriously you did not just build a house. You built and created a BEAUTIFUL home. So amazing and inspiring! Thanks so, so much for sharing at our Impossibilities challenge! A perfect fit! My husband and I have toyed with this idea, but we are both CONSIDERABLY older than you are…I was the one holding back, but you may have just inspired me to jump in! Such an encouragement! Thanks! Amazing!! I am completely smitten with your butcher block and the kitchen floor!! Impressive! We DIYed 95% of our house, too…but it took 18 months + (still working away at it 4 yrs later) and we definitely didn’t do it with cash and at your age! I’m so envious of no mortgage, I can’t even tell you. The benefit of our ages, though, was that our kids were old enough to really pitch in and help (and learn LOTS), so that was a great blessing. Congratulations! Oh my goodness!! This is amazing, LOVE your house!! Oh, that is one of my half-formed dreams! Along with living in a 100-year-old house (which my husband would probably never go for!) If we ever build a house it will have to be custom. Your home is beautiful! You and your handy husband are pretty amazing. And has anyone ever told you you look like Minnie Driver? Great job…having built a couple of houses…I totally get it!!!! It is hard work and you need to pat yourself on the back since I can’t reach that far!!!!! Enjoy! Thanks for the encouragement, Michelle! I’m headed over to visit now! But then, my husband is kind of one in a million in terms of multiple talents. He’s athletic, cute, and good with words too. Wow, I can scarcely believe it. How amazing & wonderful. I’m popping over from Vintage Revivals where you were listed as someone’s favorite blog. I can see why! I enjoyed my visit. That is pretty awesome! I don’t think you are crazy at all. If y’all have the skills to do it than why not! If I trusted my husband with a hammer I would do it in a heartbeat. if I didn’t see the pictures I don’t know if I would have believed it! oh my goodness, your house is fabulous! You should go on some kind of show!! ABBIE!!! This post is absolutely AWESOME! Thank you so much for saving it for our party. I can relate to sooo many things you wrote here. My hubs are I are the type who install HVAC duct work in the crawl space and call it date night. So impressive the sacrifices you all made to make the home of your dreams. And so impressive that you realize they really aren’t sacrifices at all when creating the life of your dreams. Job well done and cheers to you!!! Ok, how did I not know this incredible fact about you!? Absolutely amazing. Super jealous of what you guys accomplished. Congrats:) It’s beautiful. Love it, I would do it in a heartbeat if we had thought about it or thought it through. We have a custom built home on family land, so there will be no other building other than barns and such now, but if I had known then what I know now and how I enjoy doing DIY, we would have hands down. We do have many things in our home done ourselves or by my talented FIL as well. So thrilling to see your work. Great job! Your home is just gorgeous. What an amazing accomplishment! i don’t know if i have ever been more impressed. ever. that is just amazing! i know in other posts you said in passing about y’all building your house, but i thot you mean y’all were your own general contractors, not the gc’s and the subcontractors!! wow o wow just blows me away, and it is wonderful that you own it outright and to be in your 20′s omw!the last pix wouldnt load for me but i’m sure that y’all enjoy it immensely! Very impressive. Beautiful home and darling family. A terrific accomplishment. I’m so glad I found your BLOG! I don’t even know how to put into words how awesome that is! How. so. very. AWESOME!! I have goosebumps from the awesomeness. Just awesome and perfect, what an amazing story!!! Oh my goodness that is so awesome!!! You guys should be so proud of yourself!!! I’m totally inspired! Wow! Abbie, really? You really built your home from scratch and owned it flat out! Wow! That is the most amazing thing I’ve heard. Ever. What an accomplishment and I’m sure you learned so much along the way. I bet you’ll never want to leave that place. Oh. My. Word. You are amazing. Your home is gorgeous and I’m so impressed! Thanks so much for sharing this. What an inspiration! WOW! I had no idea that was your story. I am so impressed! Good for you! What an inspiration! Are you and your husband for hire? I’ll babysit! We have 3 children (5 yrs, almost 3 yrs–the 2-year-old refuses to be 2 but is “almost 3″– and 1 yr). My husband and I recently walked through IKEA and decided we should build a shotgun shack just slightly larger to fit all 5 of us and use all the amazing space-saving ideas we saw in IKEA. I’m thinking larger is doable after reading this post though! Enjoy your blog very much! Great job on your “impossible” dream! My husband and I just spent the past year creating our dream house. Instead of ground up- we gutted out and redid…. and did for a budget as well! I had to smile at your uniform photo…. I too had a similar uniform! You new home is beautiful! I love the green barn too! You two are kinda amazing, and by “kinda” I mean “completely.” Wow! This is sooo amazing and inspiring. Have you ever thought of writing a book?? Amazing. Just amazing. Wow, you should be on HGTV with this story. You did good.